Nothing will make a girl smile more in the morning than a sweet message from the man she loves. Let her know that you are thinking of her and that she is the light of your life by sending her a text message that shows just how important she is in your life. 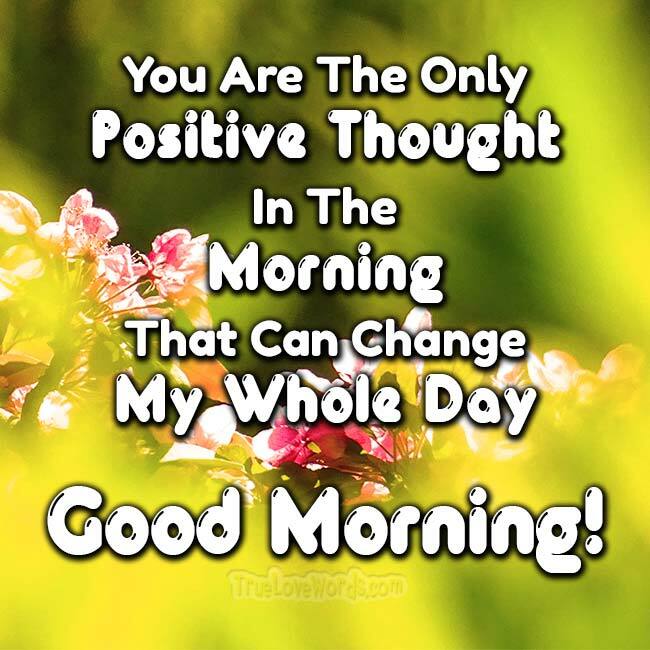 If you want an excellent, heart touching morning message, here are some ideas of romantic and sweet good morning messages for her to get you started. ♥ The light that shines from you is more vital to me than the sunlight in the morning. Rise and shine my beautiful queen. ♥ You’re the only girl in the world for me, and each day when the world turns around to face the sun, I’m glad I’m waking up with you. Good morning, my beautiful Angel! ♥ As I listen to the rain pitter patter on the roof, your smile is the bright spot of my morning. I love you, darling. ♥ The light in your eyes as you gaze at me is like looking at the morning sunrise. I can’t look away for a second. ♥ The sun has made our paths golden today. What a beautiful morning to spend with you, my lovely lady. ♥ God has given us another day filled with more blessings than we can count. But let’s try anyway. Good morning my Love! ♥ Waking up and holding you in my arms every morning is like a dream that I never want to end. Good morning, my bride. ♥ I look forward to three things from you each morning, my princess: laughter, love, and a latte. You make the best lattes. ♥ Every night I go to bed wishing for sweet dreams of you, but when I wake up, I’m glad that our love is a reality. ♥ I am truly blessed to be able to call you my love. Good morning, lovely. I hope that you have a great day. ♥ I never imagined that true love existed until the day that I fell in love with you. Good morning, enjoy your day my dear. ♥ Every morning that I wake up next to you is one that I will cherish forever. I won’t wake you up though; enjoy your day. ♥ I am blessed to be able to spend each day with you. I love you, and I can’t wait until our paths cross tonight. ♥ It’s never an ordinary day when I start it with you. Thank you for blessing me daily, my angel. ♥ Something wonderful is going to happen today. I know this simply because I’m waking up next to my girl. ♥ Rise and shine my love. The sun is up, and the birds are singing to let you know just how great the morning is. ♥ Every night that we are apart, I dream of you. You are a truly amazing woman, and I can’t wait to call you my bride. ♥ They say that God created women in the image of man, but your beauty is beyond that of an angel. Enjoy your day, sweets. ♥ When the crisp fall breeze touches our skin in the morning, all I want to do is feel your soft, warm kisses on my lips. ♥ The stars can only shine so brightly at night because you are asleep. When morning comes, you are the brightest star in my sky. ♥ Good morning sweetheart! May the bluebirds sing songs of love for you to hear as you are getting ready for the day ahead. ♥ I know that you enjoy wearing makeup, but you are more beautiful when you first awake. I truly love your messy perfection. ♥ When I wake up and hear you singing in the shower, I wish that sound could be the start of my day every morning. ♥ Girl, you be the sugar, and I’ll be the cream. When the coffee’s poured out, let’s make some steam. ♥ Gal, you’re stronger than coffee and sweeter than tea. Wake up and start the morning with me. ♥ Even the sun envies the brightness of your smiling face. I love waking up next to you each morning, my angel. 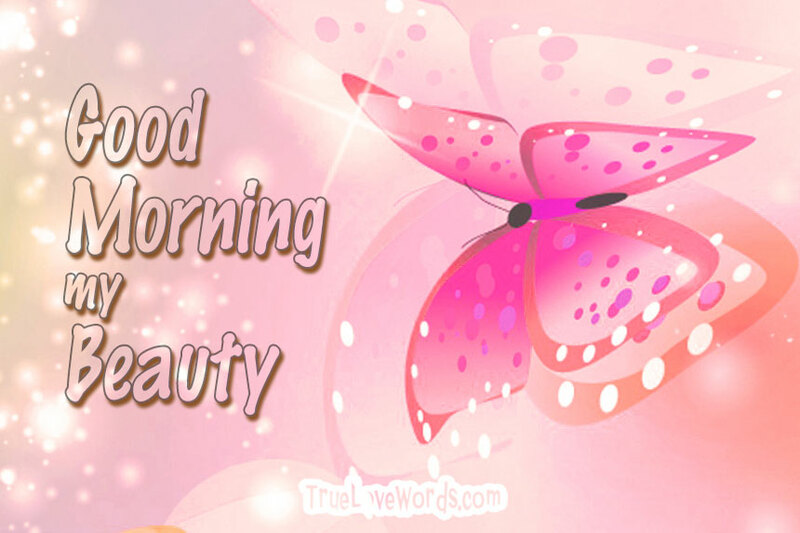 ♥ I am sending you my love and butterfly kisses this morning so that you smile as you take on the day. Good morning girl. ♥ You are my world! You were the last thought in my head last night and the first one this morning. Good morning my beauty. ♥ As each day passes, I find myself loving you more. I know I’ll see you tonight, but I just wanted to say good morning. ♥ I wish that I was the sun so that I could gently caress your face every morning as you wake. Good morning my queen. ♥ When I look into your sparkling, bright blue eyes each morning, I can’t help but get lost and fall in love with you again. ♥ My love for you shines brighter than all of the stars in the universe. Good morning darling, let me be your sunshine today. ♥ Since I can’t be there to wake you up, I left some coffee and pancakes on the counter to perk you up and start your day. ♥ Nothing warms my heart more than hearing the sound of your voice in the morning. Good morning, I hope my words brighten your day. ♥ Last night I dreamt of you, thank you for chasing away my nightmares. I hope that you wake with a smile on your face. ♥ Good morning! I hope that you slept well last night; your teddy bear will be home tonight. Until then, have an amazing day, my sweet. 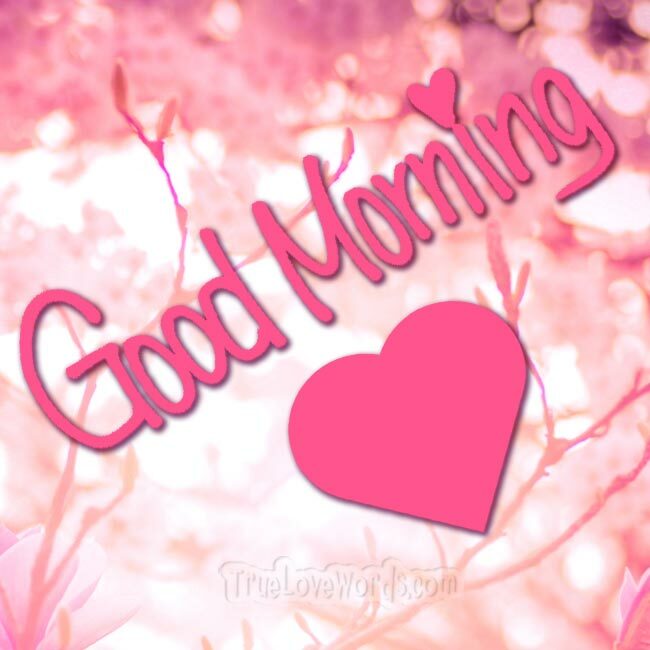 ♥ I may not be with you this morning, but I am sending you my love so that you wake up and have a great morning. ♥ I just felt you wake, so I wanted to send some hugs and kisses your way to brighten your morning a little bit. ♥ I tried to teach the birds to sing love songs to you, but I decided to send you a good morning message from my heart. ♥ I used to hate mornings, but now I can’t wait to wake with you by my side. Good morning gorgeous, and remember I love you. ♥ Coffee is the beverage of choice for many in the morning, but you are the only thing that I need to make my morning wonderful. ♥ I dreamed of an angel last night, and when I woke with you on my mind, I realized that I’ve already met my angel. ♥ You were in my mind last night as I dreamed of you, and I woke up with you in my heart. Have a great day! ♥ Your bright smile is all that I need to start my day, but some coffee with you this morning will only brighten my day. 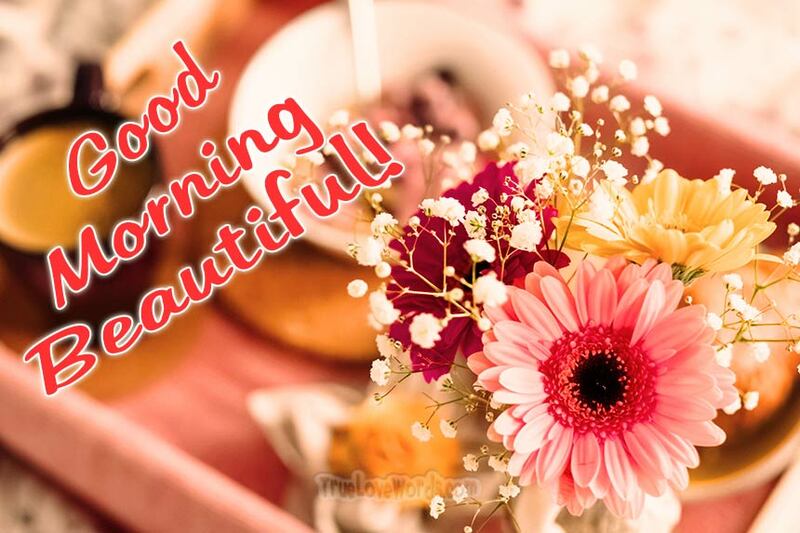 ♥ Good morning beautiful! You are the kindest, most generous, loving person that I know, and I hope you have a truly amazing day. ♥ The sun doesn’t rise until I see the love shining from those gorgeous eyes of yours. ♥ May your morning be as pleasant as your girlish smile. ♥ The morning sun can never compete with the light you spark in me each day. 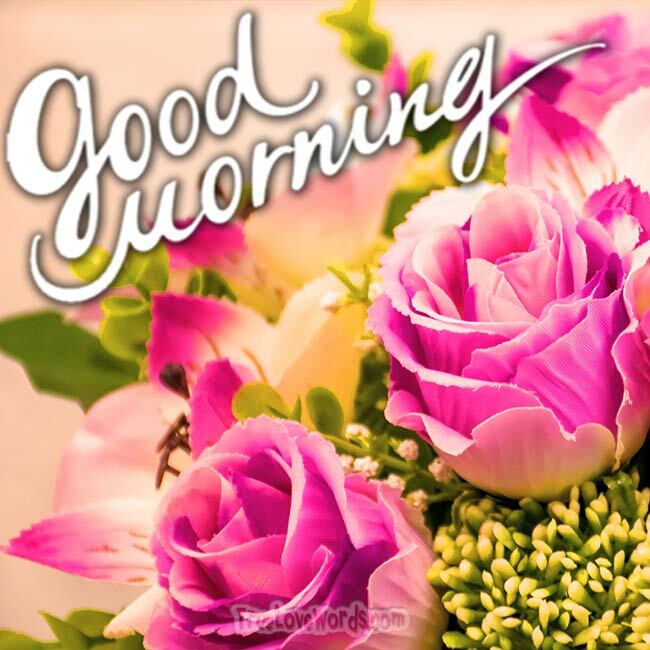 ♥ Girl, getting to wish you a good morning gets my day off to a great start! ♥ Each morning my dream girl becomes reality, and I can’t wait to wake up beside you. ♥ I treasure each morning spent with you, my beautiful angel. ♥ No time to yawn; it’s a brand new dawn, and I’m in love with you, girl. ♥ Your sweet love has turned me into a morning person. I’m blessed to be your man. ♥ The sun is rising; let’s get exercising so I can see those curves in action. ♥ Top o’ the morning to you! You make me the luckiest man alive. ♥ Whether rain or shine, I’m glad you’re mine. ♥ Each day is new when I’m with you. ♥ Wake up and be treated like a queen. 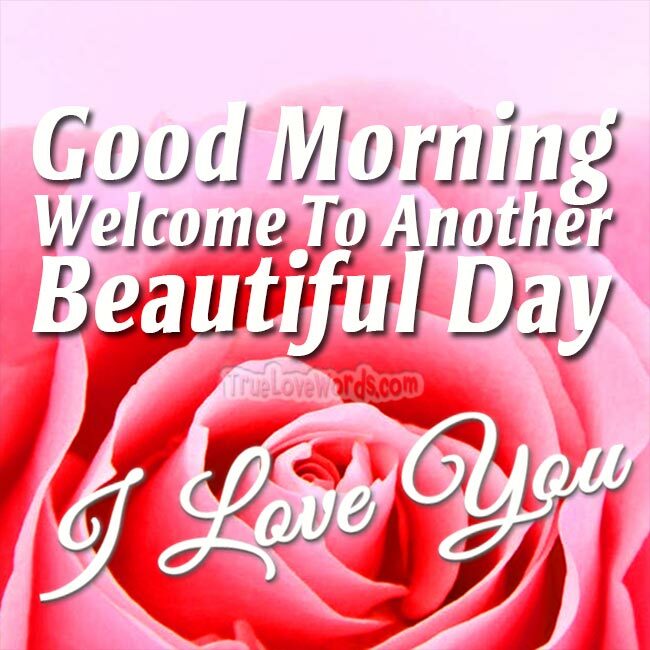 ♥ Good morning, and welcome to another beautiful day, my precious girl. ♥ The morning comes in as soft and warm as a kitten when I’m with you. ♥ Wake up cutie, my sleeping beauty! ♥ Let’s kiss and tell and break this spell. ♥ Wake up, my adventuress. Life is calling on this beautiful day! ♥ It’s a new day and a fresh start. Time to kiss your man, Good Morning Sweetheart! ♥ Wake up and kiss me, girl! I’m ready for my morning goosebumps! ♥ Girl, I love you a latte! Get over here and espresso your love to me this morning! ♥ Every single morning, I choose you, girl. And coffee. ♥ You bring me to life each morning when I wake up and see your angelic face. ♥ The morning is here. Let’s pull up a pillow and talk. ♥ Coffee in your hand, and kisses from your man. That’s how you start the day. ♥ Open your eyes to a nice sunrise. Then close them again as my kiss comes in. ♥ Wake up, little miss; it’s time for your kiss! Good morning my Love! ♥ You are both a necessity and a luxury, and my day can’t start without you, lady. ♥ I think you’re beautiful, and you think I’m handsome. ♥ Our mornings together are worth a king’s ransom. ♥ Good morning, lady. Time to caffeinate so we won’t be late! ♥ My beautiful girl, it’s time to live out another day. I hope it’s a great one. ♥ Wake up, girl, and let’s make our own sunshine. ♥ This morning will never come again. Let’s make the most of it, my little chickadee. ♥ Girl, you are the milk in my Cheerios and the jelly on my toast. ♥ Get up and kiss the man who loves you the most. ♥ Girl, roll over and give me some sugar to go with this coffee. ♥ The sunshine is more special when it wakes us up together, pretty woman.